We would like to wish John and Megan a Happy Birthday! Megan has been with us for five years, she recently switched roles from clinical assistant to scheduling coordinator. She loves the interaction that scheduling coordinator offers. Megan is celebrating her 24th birthday on Jan. 28th! In her free time she enjoys skiing, spending time with her husband, Nick and daughter Sage. She’s excited to be welcoming another baby girl into the world — June 2019! John has been dedicated to our office for 6 years. You can catch him in the lab making retainers or working in the front office. John loves music, cats, playing guitar, football, and his lovely wife, Jessie! He does a lot of work behind the scenes and we’re so grateful to have him! Make sure to wish him a Happy Birthday on January 29th! Thank you both for all you do! Parrott Orthodontics is starting a new holiday tradition this year! We’re working with the Valley Mission in Staunton to help give back to the community! Christmas is right around the corner and we have a fun way for our community to get involved in giving back during the holiday season. We are having a stocking decorating contest! Our office will provide plain stockings and you get to decorate the stocking any way you choose — you could pick a theme or just add your own spin on things. Pick up a stocking from our office to take home to decorate. These stockings will be going to a variety of men, women, and children in our area. Please no alcoholic beverages, tobacco products, perishable foods, or canned goods. Return your decorated and filled stocking to our office at 17 Gosnell Crossing Staunton, VA 24401 by Monday December 17, 2018 by 5:00 pm. Our patients will vote for their favorite stocking in the office and the winner will receive a gift basket put together by our office, including a gift card of your choice! If you have any questions, please call our office at 540-949-6600. Our office will drop stockings off at the Valley Mission on December 22, 2018. We are so excited to see what fun ideas you all come up with and a huge thank you for choosing to help out those within our community! We love showcasing these new smiles as much as our patients do! It is so rewarding to sit back and see the finished result at the end of treatment! 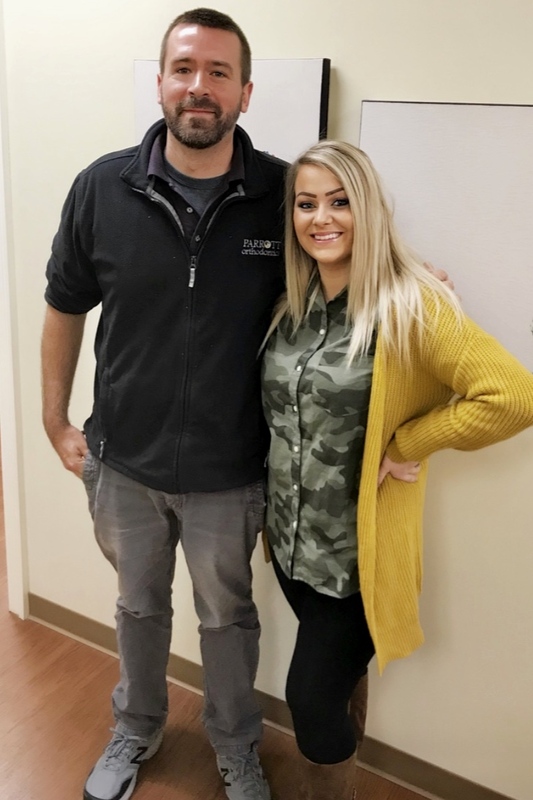 It is always exciting to see our patients hard work pay off when they get to have their braces removed, and what better what to show off that smile then with one of the assistants that helped you achieve that smile! Invisalign® is a clear alternative to braces that uses a custom-made series of aligners to help straighten your teeth. We say "series" because you receive a new set of aligners approximately every two weeks until your treatment is complete. The aligners are trays that are made of comfortable and virtually invisible plastic that you wear over your teeth. Over the course of your treatment, because each aligner is slightly different, they gently shift your teeth into place. No metal brackets or wires! Invisalign isn't for everyone. Patients with severe cases may not be candidates. Also, Invisalign is a good option for older teens and adults, but it's not recommended for children or tweens because their teeth are still growing. Also, it can be removed, and in order to be effective, it must be worn 20-22 hours/day. Of course, we will work with you to determine if Invisalign is an option for your dental needs or a good fit for your lifestyle. You don't have to come see us as often! The cost of Invisalign is comparable to traditional braces. Of course, it varies from patient to patient depending on needs. As with braces, we offer payment plans and help determine if insurance is a viable option, which you can read about here. As with all treatments, there are things worth considering before deciding if Invisalign is a good fit for you. (Of course, this is assuming you've been told by your orthodontist that you're a good candidate.) Here is a humorously candid real-life story that was posted on Shape magazine's blog last year that paints a pretty accurate picture of what life is like with Invisalign: 10 Invisalign Truths to Know Before You Try. It's one of the most frequent questions we hear from patients: "What can I eat with braces?" Having braces doesn't mean that you will be living on pureed, bland foods. But, there are some limitations, especially at first. Knowing what foods you can and can't eat with your braces will help you achieve the best results - and keep you from having to continuously get those brackets and wires fixed! Eating with braces can be a little tricky. For the first few days or so, stick to soft foods like pasta, soups, soft fruits, and steamed or mashed vegetables. Smoothies also are a great option. For the duration, you'll want to make sure you're protecting your braces and brackets, which aren't meant to withstand hard, crunchy, tough or sticky foods. Most people find that they are more comfortable and can chew food more properly two to three weeks after the braces go on. Patience is the key when it comes to eating with braces. Remember to chew slowly and carefully. Cutting your food into small pieces also makes eating easier. Avoid eating anything hard or crunchy. This includes hard candies, hard pretzels, pizza crust, hard chips (e.g. Doritos or Tostitos), hard cookies, raw carrots, nuts, and ice, to name a few. Avoid meats with bones. This includes chicken wings, legs and thighs, and ribs. The good news is that you can cut or peel the meat off of the bone and eat it. Avoid “biting off” or "biting into" foods. Cut apples, pears and large pickles into small pieces and chew them with your back teeth. Also, you need to cut corn-on-the-cob off of the cob. Avoid chewing on pens, pencils and your nails! The moment you've been waiting for: the list of foods you can eat with braces. Soft foods. In the first couple of days, stick to liquid-based foods like yogurts, apple sauce, smoothies, oatmeal, scrambled eggs, pudding and soups. Mashed potatoes are a good option, as well. You can also cook fruits and vegetables to make them softer. Soft Breads and Grains, such as sliced lunch bread, soft tortillas, pancakes, muffins without nuts, and biscuits. Also noodles, pasta and soft-cooked rice are fine as long as you take small bites. Meats and Poultry - Just remember to cut your meat into small bite-sized pieces, and not to bite it off the bone. Fruits, such as bananas, peaches, grapes, blueberries and raspberries. Pears and apples are ok as long as you cut them into small or thin pieces. Today, more than ever, adults are getting orthodontic treatments to correct and perfect their smiles. According to the American Association of Orthodontists, 1.2 million adults received orthodontic treatment in 2012 (the most recent statistics available), which is up by 40% from 1996. By comparison, about 4.65 million orthodontic procedures were performed for patients age 17 and younger in 2012, up 32% in the same period. We've seen a similar growth rate here in the Staunton, Waynesboro and Fishersville areas. There are more discreet alternatives to braces, like Invisalign®, are helping to attract these adult orthodontics patients. Invisalign is custom-made clear aligners that sit firmly over the teeth. They are removable, so there are no limitations on what you can eat and drink (as opposed to braces, which have several limitations), and they are easy to clean. Best of all, they're virtually invisible. In addition to Invisalign, we also offer ceramic braces, these are tooth colored brackets which are less noticeable than traditional metal brackets/braces. Many of our patients also prefer standard braces. They're more cost effective, and because many patients had them when they were younger (and failed to wear their retainers for preventative measures! ), they're familiar with braces. We'd love to hear from our adult patients! Feel free to comment and share your experiences with us. In the market for a new smile? Please call us and schedule an appointment for a consultation! Alternating Mondays and Fridays are staff days.